I’m having a little pity party over here because I have to go in to work today. I love my job and I love my coworkers but maybe I love Saturdays more. Ah, well. All independent schools have admissions-related events and it’s just a part of life. I had a chuckle when I saw the following in this week’s letters to the editor in the Columbia Flier. I think we can all agree that Elkridge may be justified in feeling that they are the part of Howard County that “just can’t get no respect”. However, may I suggest that playing the “Rouse rolling over in his grave” card may only be played by Columbians? Just a thought. Also, perhaps we need to hire someone to keep an eye on Mr. Rouse’s grave since there is reportedly so much activity there. 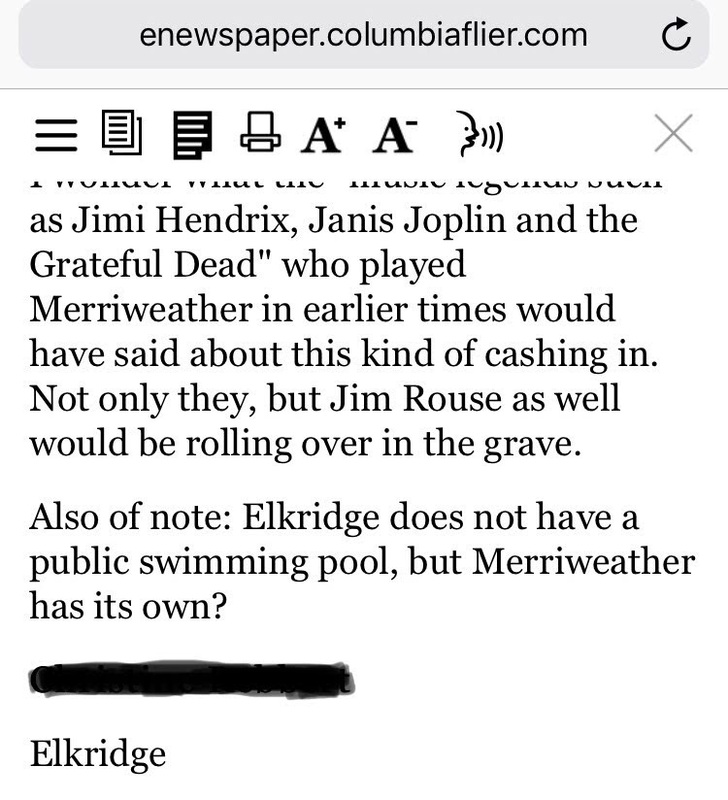 Oh, and I think it would be a great public relations move for MPP to invite the citizens of Elkridge to use their swimming pool. They’d need to bring their own towels. They’d also need to bring a whole lot of patience becaus the Merriweather pool is an amenity built for traveling artists and its swimming capacity is quite small. It’s hardly a community pool. Now that I think about it, wouldn’t it be cool to have Merriweather Post Pavilion and Pool? Imagine taking a cool dip in the middle of one of those scorchingly hot summer concerts. It could be an add-on at the point of purchase, so they could keep a handle on capacity. I’d recommend no alcohol/pool mixing, but maybe that’s just me and my teacher safety concerns kicking in. 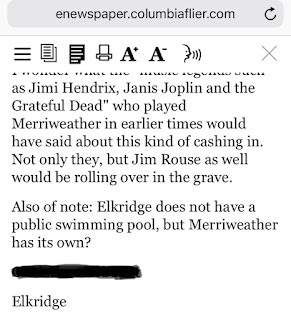 So maybe Merriweather should build a pool. And let Elkridge use it, of course. Or maybe I should get dressed and go to work because this has gotten ridiculously silly.